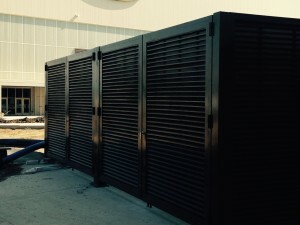 For over fifty years, we have been designing, engineering and installing industrial equipment screen walls, industrial louvered screen, mechanical equipment enclosures and architectural screening systems. 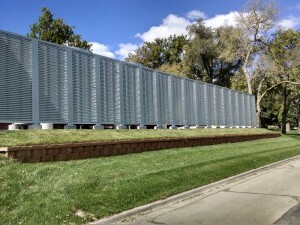 In addition to our custom louvered screen wall fabrication division, PalmSHIELD fabricates square welded and woven wire mesh screen, grating, and perforated metal screen. You can find our work from the base of the Grand Canyon to the midst of the Yellowstone Forest. PalmSHIELD is the ultimate architectural equipment screening. PalmSHIELD is also a leader in cable railing systems. We fabricate systems for both interior and exterior applications. We have learned a thing or two about cable railing systems. For this reason, PalmSHIELD has designed its own full framed cable railing system. We have a fully welded frame design or a field assembled design that can be field modified for changes in both elevation and direction. Fully framed is critical as cable railing requires at least ten cables to be tighten to a pull force greater than 1000 pounds. With no full frame, the system pulls significantly where the post is anchored to the surface. This is not always predictable and will cause system failure. Our fabrication division operates in a forty thousand square foot facility that provides complete fabrication and coatings. Our team is lead by a seasoned group of certified welders, coaters, project engineers and drafters. All we do is custom fabricate architectural products. Perforated metal, square woven and weld mesh, grating, industrial louvers and welded wire mesh screens are some of our top products. We have installed other manufacturer’s louvered, perforated metal and square mesh screen systems over the years. Our experience with these systems was not satisfactory. Our systems are designed to overcome all of our challenges in delivery, installation and sustainability. Having installed hundreds of screen wall systems and thousands of gates, we know a few things about what works and what does not. What sets PalmSHIELD above all others is its fully framed manufactured panels and ease of installation. This rigid and robust frame protects the louvers, perforated metals, grating, cable railing and welded wire mesh during shipping, installation and for years to come. No assembly required. Our gates are manufactured first as standalone gates. We then fit our PalmSHIELD infill panels. Our system is designed with the installers in mind. All of our panels and posts are factory aligned, then drilled and punched. All of our hardware is factory installed, removed and packaged. We factory install all the cabling for our cable railing. We are often not only the manufacturer but the installers as well. Our direct line of communication with the field gives us constant feedback and motivation to get it right. PalmSHIELD has designed its own line of industrial hinges: the Gorilla Hinge. This hinge uses a half inch thick plate to mount to both the gate and gate post. The Gorilla hinge has a slight offset on the hinge plates to allow the gate to slightly close past full close. This intended design quirk was incorporated because we realize that not everything happens exactly like you want it to in the field. Sometimes, the gate posts are set an eighth to a sixteenth of an inch out of square. This is not noticeable at the post but a typical hinge would not allow the gate to come to a full close if the gate post was not set perfectly square. We empathize with these field irregularities and believe it is our responsibility to find a solution to offer our customers some flexibility. 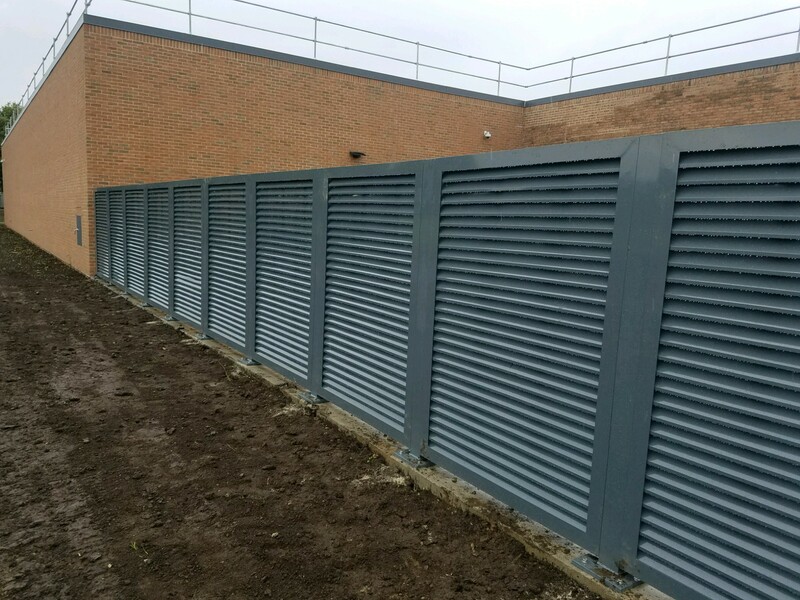 PalmSHIELD louvered screening, walls, perforated metals, welded wire mesh and grating systems are perfect for providing excellent ventilation while keeping items out of sight from others. Using the industries’ only picture frame design, each panel is rigid enough to stand on its own. Maintaining a consistent design throughout the system, PalmSHIELD can be configured as a series of screens, grills, swing gates and even sliding gates. PalmSHIELD is unique in providing the industries’ widest louver. 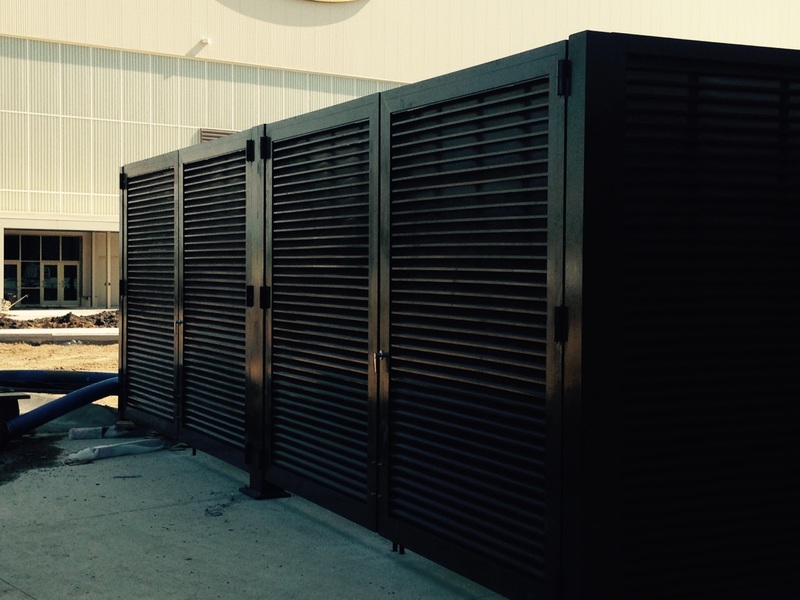 Each louver is .1250 thick with an installed profile of 2” x 2.873” tall. Not only is the PalmSHIELD a larger profile but the entire profile is sloped providing less visibility and better air flow. We offer a wide arrange of perforated metal, square welded or woven wire mesh and grating infill options. Only PalmSHIELD uses a 3” x 3” x ¼” angle vertical supports. Each louver is welded to the vertical supports. Our welded wire mesh, grating and perforated metal is shop welded to meet all IBC and UBC codes. Because of the larger vertical support, PalmSHIELD provides a 2 ¾” weld-able surface to attach louvers to the frame. We use this same robust frame for our welded wire mesh, perforated metal panels, and grating. What makes PalmSHIELD the very best louvered, perforated metal, square welded wire mesh and grating system is the use of a 3” x 3” x ¼” angle top and bottom cap. Most systems do not provide a rigid top cap. A top cap is critical in protecting the panel from falling debris, hail, etc. while the bottom cap protects the louvers from foot traffic and mowers. As a matter of fact, PalmSHIELD louvers standard design uses a ½” overlap based on direct visual screening. Direct visual screening is the standard measure for determining the percentage of visibility. It is exactly as it is described. Based on looking head on at a perfect horizontal plane to a louver that is installed plumb, can you see through the louvers? Any visibility at this vantage point is a percentage of visibility. PalmSHIELD’s standard design uses a ½” overlap of louvers. This guarantees 100% direct visual screening under any circumstances. 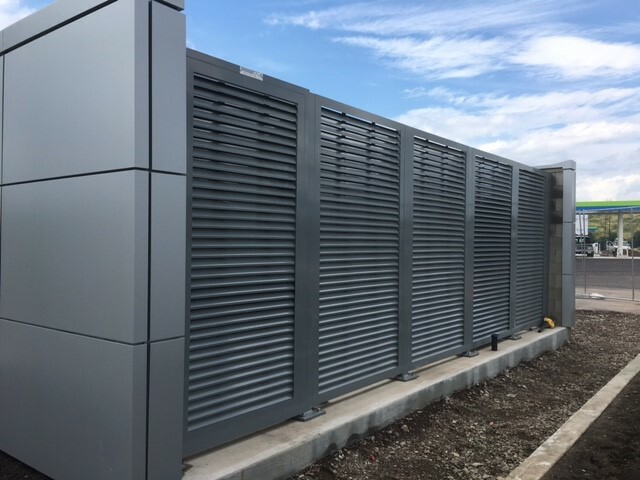 We are happy to modify our louvers to provide a lesser percentage of direct visual screening for our customers which would require we space the louvers farther apart. Our 100% direct visual screening is directly related to our percentage of openness. The percentage of openness is the actual openness between the louvers over a specific area. The smallest opening between two louvers is the greatest factor impacting the percentage of openness. PalmSHIELD louvers typically louver opening based on 100% direct visual screening is 2 ¼” In other words, with 4” tall louvers spaced 3 ½” on center, the smallest opening is 2 ¼”. Boiled down, every 3 ½” of travel, there is a 2 ¼” opening. This ultimately translates into approximately a 64% free area. Any louvered screen will increase the wind load on it supporting structure. This has traditionally been an educated guess with a considerable safety factor. 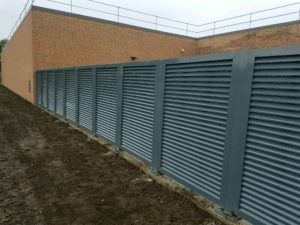 However, most architectural louvered screens are attached to adjoining walls and buildings that must meet an even greater wind load coefficient for solid surfaces. Though PalmSHIELD may be installed as a wall louver where the louvered panels are installed like windows and attached to the building structure; PalmSHIELD louvers has its own independent structure that classifies it as a standalone louvered equipment screen system. It’s this independent structure that carries the load of assuring the overall system meets the latest IBC and UBC codes. PalmSHIELD has been designed and engineered to meet these codes. Through measured calculations, PalmSHIELD’ s louvered panels with an 80% opening has a horizontal load of 19 psf. This wind load calculation is based on 100 mph winds which complies with the 30psf load requirement on solid building surfaces. This load calculation is then used in calculating the design of the structural post system that supports the panels. From this calculation, we can determine post design, material selection and post spacing. By applying this load to the square footage of the panel size; we can properly estimate these specifications on a per case basis. It must be stated that these are only estimated loads because loading will vary exponentially based on the height of the panels. 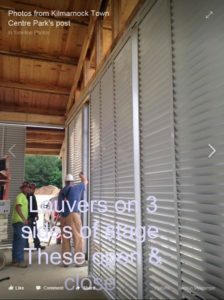 Not all wind loading is equal top to bottom of the louvered panel. For actual engineered calculations, each system must be independently engineered by a registered engineer within the jurisdiction it will be installed. This level of engineering is not included in the standard PalmSHIELD quote. If local stamped engineering is required for your system, please indicate so at time of quote. We will contact a local engineer in the respective jurisdiction and work directly with them to provide the necessary calculations. What is important to recognize is that PalmSHIELD is not just another louvered screen system manufacturer. We design each system with the customer in mind. PalmSHIELD gate install with new internal locks. Love em! PalmSHIELD is the perfect solution for mechanical screening and equipment enclosures.